Response improvements of 50 per cent and boost at idle! Last week we covered the technology of air bearings - an approach that will reduce the bearing wear of a spinning turbo to zero, in addition to reducing lag. In this article we explore the technology of electrically-assisted turbos, a development which in one go takes away nearly all of the negatives associated with traditional turbochargers. No matter how well it is matched to an engine, a turbocharger still has poor low-load performance. This is because the performance of the compressor (the part of the turbo that pumps air into the engine) is dependent on its speed of rotation. Since it is connected straight to the turbine, before the compressor can turn quickly enough to move significant amounts of air into the engine, there needs to be sufficient exhaust gas flow to whiz the turbine around. In a steady-state situation, there's no problem. The engine develops lots of exhaust flow and the turbo is spinning quickly, pushing fresh air into the combustion chambers. The resulting burn produces vast quantities of exhaust gas which keeps the turbo spinning, allowing it to continue to pressurise the intake. But in cars, a steady-state high-load condition is quite rare. Instead, it's much more likely that full power will be needed following a time of quite light load. For example, you're driving along at 60 km/h and then put your foot down hard. This situation is quite different - it's the transient performance of the turbo that becomes critical in determining how quickly the engine torque output will increase after your accelerator movement. When a driver opens the throttle wide at low load, there will be a time delay while the exhaust gases of the engine build in volume, the turbo responds by increasing in speed, more air (mixed with fuel) is forced into the engine, a greater amount of exhaust gasflow is developed, the turbo spins harder, and so still more air is forced into the engine. This delay between the movement of the driver's right foot and the actual increase in engine torque output is known as 'turbo lag'. In addition to the chicken-and-the-egg process of waiting for the volume of exhaust gases to rise before more intake charge can be forced into the engine, the speed of turbo reaction is also affected by the rotor's inertia and the frictional bearing drag on the turbo shaft. The inertia is decreased by the use of exotic light materials (although ceramic in this application has developed an unfortunate reputation for shattering when the turbo is taken beyond its strict design limitations) and bearing drag is reduced by the use of ball bearings, rather than the older sleeve bearing design. Air bearing technology looks set to reduce bearing drag even further. Currently, if strong bottom-end turbo response is required, a small turbine is fitted - which reacts more quickly to lower exhaust gas flows. 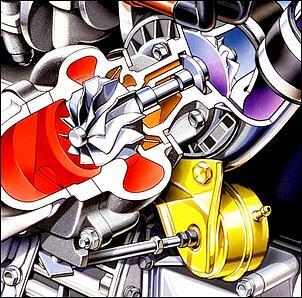 However, such a turbo also causes quite great exhaust backpressure, choking flow at high power outputs. On the other end of the turbo, a large compressor that is spun up to speed too early can result in compressor surge - a problem where the aerodynamic behaviour of the blades changes as a result of the air not being accepted by the engine. So with the current state of turbo engineering, the bottom line is to use a small turbo if you want the engine to be responsive at low loads and are prepared to trade-off some top-end performance, or fit a much larger turbo if peak power is important but bottom-end response doesn't matter. An alternative with current turbo technology is to use two turbos, in either parallel or sequential configurations. In a parallel approach (eg the Nissan Skyline GT-R or Toyota twin turbo Soarer) both turbos blow together all of the time. The benefits of this approach come from the reduction in rotor inertia of using two smaller diameter turbo assemblies, rather than one big one. A sequential system is different - one turbo initially gets all of the exhaust flow (and so comes on boost quickly) and when the exhaust gasflow of the engine is sufficient, the second turbo is brought on-stream. 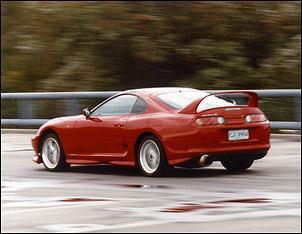 The Mazda RX7 twin turbo and Toyota Supra twin turbo are examples of cars using this approach. Parallel twin turbos give reduced lag, however packaging two turbos under the bonnet is expensive and difficult. Sequential twin turbos can work very effectively indeed but the costs of engineering a complex changeover system in addition to the expense and packaging disadvantages of using two turbos means that this approach is very seldom carried out. A point that needs to be made from the outset is that electric-assist turbochargers can make use of all the technologies also available to improve traditional turbochargers. So, a variable nozzle turbine, air bearings, twin scroll turbines, lightweight compressor wheels and so on can all be integrated into electric-assist designs. In fact, the two most recent technologies - air bearings and electric assist - will almost certainly be used in the one production unit. 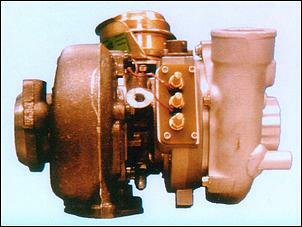 So what does an electrically-assisted turbo consist of? Surprisingly, the prototype designs look very much like normal turbos, with the exception of a slightly larger centre housing. Within the centre housing, and located just behind the compressor wheel (ie towards the cooler end of the turbo) is a permanent magnet, brushless motor. The permanent magnets are carried on the rotor, while around the shaft are stator windings formed on conventional laminated steel cores. In some patented designs, the permanent magnets are mounted on the back of the compressor wheel, housed within a machined shoulder and held in place by a steel sleeve. One advantage of placing the magnets on the compressor wheel is that it is easier to keep them cool - the compressor being cooled by the ambient airflow passing through it. (The temperature rise due to the air being compressed takes place well away from the magnet location.) However, the rotating inertia of the turbo is increased with the magnets in this position, and the extra mass placed so far outboard of the turbo bearings can make the turbo shaft unstable. Recent designs have not followed this path, instead placing the magnets directly on the main shaft. The use of permanent magnets and individually wound stator assemblies allows the motor to be run without the need for brushes or a commutator - both would be impossible with the speed and power required of the motor. To operate the motor, the windings are energized in sequence, with the speed of the sequencing determining the speed of shaft rotation. 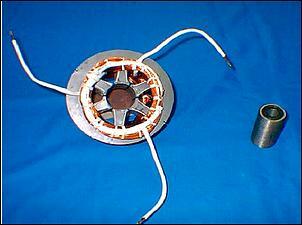 The motor can also easily become a generator, ie be made to work electrically backwards. So that the minimum of exhaust heat is transferred to the motor assembly, much attention is paid to the way in which the oil flow through the centre bearing of the turbo is controlled. 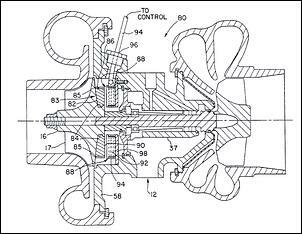 In addition, some patents for electrically-assisted turbos show an ancillary air cooling pump which is brought into action after a hot shut-down. In this design, a hollow rotor shaft is used, with air blown from the electrically-driven external pump into the compressor-end of the shaft by a nozzle mounted just distant from the end of the shaft. The air that is blown into the turbo's hollow shaft travels through it and out the other end, so cooling the motor assembly. If required, this forced air-cooling can also be used during normal turbo operation, with a bleed of pressurised air from the turbo compressor being used to provide the airflow. Yet another patented design places passages carrying engine coolant adjacent to the motor stator windings in order that their temperature rise is limited. 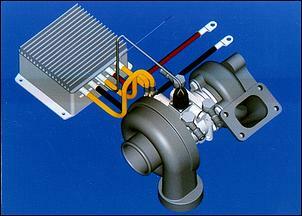 The latest prototype Garrettt electrically-assisted turbo does not use external air cooling or water-cooled windings. The placement of an electric motor within the turbo also allows the easy location of speed and position sensors. In fact, to switch the windings in a brushless electric motor, an internal sensor is always required. A Hall Effect sensor, that responds to the presence of a magnet, can be easily integrated - the magnets are, after all, already there! With such a sensor, the speed of the turbo can be closely monitored, with this information being fed back to the control electronics. In addition, the turbocharger control electronics can have normal engine management inputs, eg manifold pressure, intake air temperature, air/fuel ratio and so on. The solid line shows the turbo response of a conventional turbo fitted with a wastegate. As can be seen, boost pressure rises relatively slowly at full throttle, increasing until it reaches the boost pressure limit, where the wastegate opens, bypassing exhaust gas around the turbine and so limiting boost pressure to this value. This is of course what happens in every turbo petrol engine - but what's often not considered is that any wastegated exhaust gas is not being made use of. Instead of doing work, it's just being shot out of the exhaust pipe like in a naturally aspirated car. But the reason that it needs to be bypassed around the turbine is shown by the long dash/short dash line: if all of the exhaust gas continued to pass through the turbine, boost pressure would continue to rise excessively. But by using the electric motor contained within the electric-assist turbo as a generator, an additional load can be placed on the turbine. 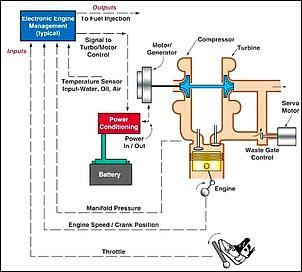 Even with all of the exhaust gas passing through the turbine all of the time (ie no wastegate being used), the turbo shaft speed can be controlled by the motor, which is now acting as a generator. So, as can be seen by the dashed line, the electric-assist turbo can generate boost noticeably earlier than the conventional turbo, and then hold the turbo back at the speed at which the full boost has been achieved, generating electricity for the car's battery as it does so. 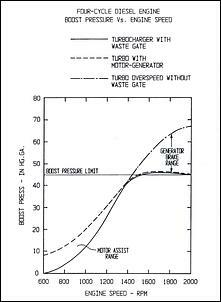 Note that not all prototype electric-assist turbos use the motor/generator to limit boost - some still retain wastegates or variable nozzle designs. The way in which the electric-assist is used depends on the application of the turbo, but one approach would be to use full electric assist when the driver requests (via the accelerator pedal) lots of torque at low engine loads, and then for just short bursts during transients (ie when quick in-gear acceleration is needed). On the electric generator side of things, it may even prove more efficient to electrically load the turbo during cruise to generate power for the car's battery rather than take power directly from the crankshaft via an alternator. The problem with electric supercharging is the massive electrical power needed. For example, 10kW of electrical power in a car using a nominal 12-volt electrical system (ie 13.8V running) would need a current flow of at least 700 amps. This amount of current has major implications for how quickly the battery would be flattened (you'd certainly expect the headlights to dim when the assistance was on! ), how heavy the wiring needs to be, and for the design of the electronic switching control unit. In addition, the electric motors need to be very special if they are to attain the required very high rotational speeds (eg 100,000 rpm) and survive the huge current flows. The Detroit Diesel Corporation and the US Government's Oak Ridge National Laboratory carried out some testing to ascertain the power that the motor in an electric-assist turbo would need to have if it was to be effective. 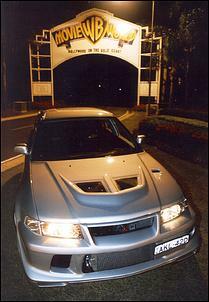 Their goal was to improve turbo transient performance by 50 per cent, ie halve the time for the turbo to come on boost. 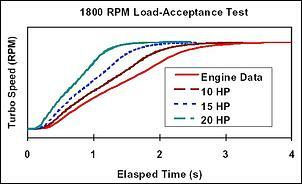 Some of the results of the research can be seen in this graph, which shows turbo speed against time. The red line indicates the response of the turbo with no assistance, the brown line the response with 10hp (7.5kW) of assistance, dotted blue - 15hp (11kW) of electric motor power, and the green line - 20hp (15kW) of assistance. Obviously, the greater the power of the electric assist motor, the quicker the turbo accelerated - no surprises there! However, the team decided to concentrate their efforts on the development of a 7.5kW design, with the prototype electric motor shown here. In testing, the motor achieved a speed of 60,000 rpm. Note that the research was carried out on a fairly large and heavy truck turbo. The Honeywell/Garrettt electric-assist turbo design that is currently being developed is not aimed at truck applications; instead it is expected to be suited to petrol and diesel engines of around 2 litres. As a result, it doesn't need as powerful an electric assist motor - in fact, it's tipped to be about 1.8kW - or 1800 watts. This amount of power still represents a current flow (with a 100 per cent efficient electric motor) of 130 amps, but that's a lot more manageable than 700 amps! Still, dissipating this much power in a small electric motor - one which is already mounted within a hot turbo - is likely to mean that the time that the electric assist can be switched on continuously will be limited. Suggestions are that a 3 minutes on, 1 minute off cycling may be needed at this power level. The Garrettt electric-assist turbo will be able to be used as a generator, delivering about 1.2kW continuously (ie not needing any rest period to cool down). Transient boost response is tipped to be improved by at least 50 per cent over conventional turbos. It's thought that Garrett is currently working with Saab on introducing a production electric-assist model featuring the technology. An examination of the US patent archives shows that US company Turbodyne Technologies Inc owns most of the patents for technologies associated with electric turbochargers. 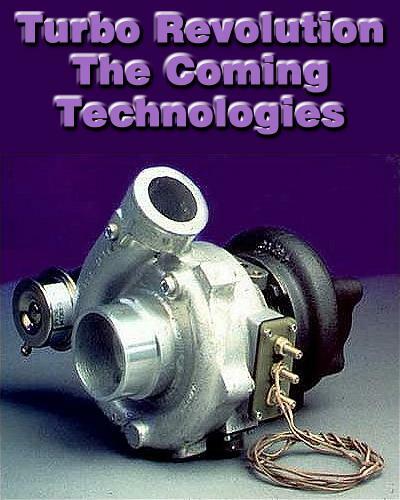 In January 1999, Turbodyne and Honeywell (owners of Garrett) entered into a joint-development and license agreement relating to Turbodyne's Dynacharger, an electrically-assisted turbocharger. 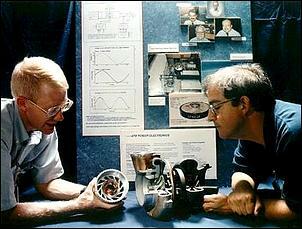 In December 1999 the agreement was extended to include Turbodyne's Turbopac - an electric-powered supercharger. However, the relationship has since soured, with Turbodyne Technologies Inc recently filing a US$9 billion antitrust action against Honeywell International Inc. Turbodyne alleges that Honeywell "did not proceed in good faith to commercialise either group of inventions. Rather, it used its position as Program Manager of the joint development program to block such commercialisation and to suppress Turbodyne's technology. Honeywell's motive for doing this.... was to avoid disruption of Honeywell's existing multibillion-dollar turbocharger business." Honeywell has also initiated arbitration proceedings against Turbodyne, seeking termination of the joint development agreement and unspecified damages. Including these actions, as of September 30, 2001, Turbodyne Technologies was involved in no less than ten legal cases, including action alleging malpractice of its attorneys, action alleging fraud of its former light metals subsidiary, and action alleging a breach of fiduciary duty by the company's former management.